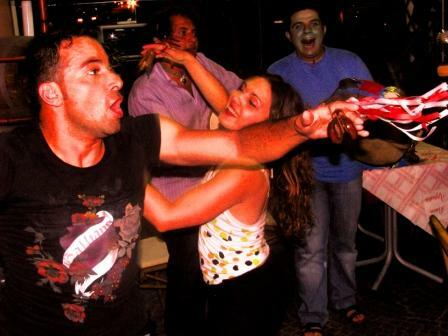 Tanta acqua e delusione alla festa degli zingari di Riace. Il maltempo ha fatto man bassa di “rote” e tarantelle lasciando appena lo spazio per l’irremovibile processione dei santi Cosimo e Damiano patroni di Riace, protetti da un grande telo di nailon e a loro volta protettori dei nomadi. Nonostante la pioggia tuttavia decine di fedeli hanno percorso lunghi pellegrinaggi dai paesi limitrofi anche di 40 km per giungere al santuario di Riace e centinaia i fedeli che hanno seguito la processione sotto un’incessante cascata d’acqua. Gli zingari non se la sono sentita di aprire come di consueto la processione con i loro balli e le travolgenti musiche, mettendo a tacere quindi la parte pagana della festa. Peccato, i racconti su questa celebrazione mi avevano veramente incuriosito. Sconsolato e inumidito ho così deciso di lasciare Riace per approdare in Sicilia. Un lembo di... mare ci separa; la guardo dall’altra sponda e lei sembra guardare me, è vicinissima, è la Sicilia. Da qui sembra ancora più vicina, una nuotatina. In realtà sono tre km, quindi meglio che li faccia con il camper; con il camper sopra una barchetta naturalmente... Però aspetterò ancora qualche giorno, in realtà dovevo attraversare oggi lo stretto per incontrare i miei contatti a Enna, ma poi dovrei tornare venerdì per la festa degli zingari a Riace (RC). Un po’ per pigrizia, un po’ per motivi economici (l’attraversata in camper costa più del previsto) ma un po’ anche per l’aspetto emozionale del gesto, aspetterò lunedì. La Sicilia rappresenta l’ultima tappa del cammino prima di cominciare la risalita, il dietro front, il ritorno (seppur in tempi comodi). La guardo e già mi manca, strano no? Ne sento già la mancanza!! Mi sembra di esser al di qua, a salutarla dopo una lunga esperienza, a darle il mio addio come faccio in genere con gli altri paesi che lascio e gli strascichi che rimangono. Quindi me ne sto ancora un po’ qui a guardare questa terra illuminata da un raggio di sole che perfora le nuvole e pare ammiccare; e a gustarmi questo momento che forse, non vivrò mai più. I am in Alessandria del Carretto (CS)in the middle of the Pollino National Park. Here a growing group of women dedicates part of the year thinking about how to adorn their crowns in honor of the Madonna of Carmine. These are real devotional works of art made following specific construction rules (mostly local rules). There is space for a moderate creativity which is never intrusive and... heavy: in fact the women parade during a dancing procession for six hours taking the crowns on their head. The procession begins in the evening of 23rd of August, when Margaret tells me to follow her in the house to take the crown. This is the first time for her, she made a beautiful red coloured crown, different from the others: "Those of Plataci (village Arbëreshë CS province) have this squared shape ... for me it was a coincidence, because my father is from Plataci and almost unconsciously I created a mix of the typical shapes of Plataci and Alessandria. " Her mother is waiting for her with the new crown on her head and barefoot: "This year I decided to perform the whole procession barefoot as a sign of devotion". Women, who were looking at her curiously, later told me that once there were many barefoot women; anyone who had a vote walked barefoot and stripped of the wedding dress in front of the Virgin Mary. We leave from Margherita’s house followed by a small procession of bagpipe and tambourine musicians. In the first part of the festival there is the search of all the crowns present in the streets of the village. After a few meters walking we already see the first one: she is Angela with its crown that represents the dome of a church. The two crowns meet each other and dance together a tarantella, then they continue the way until the group will be completed. This year there are six crowns. They will be kept in the church until the next morning. At 9.00 a.m., the women dress the Virgin Mary, they take her on their arms and leave for the long pilgrimage. 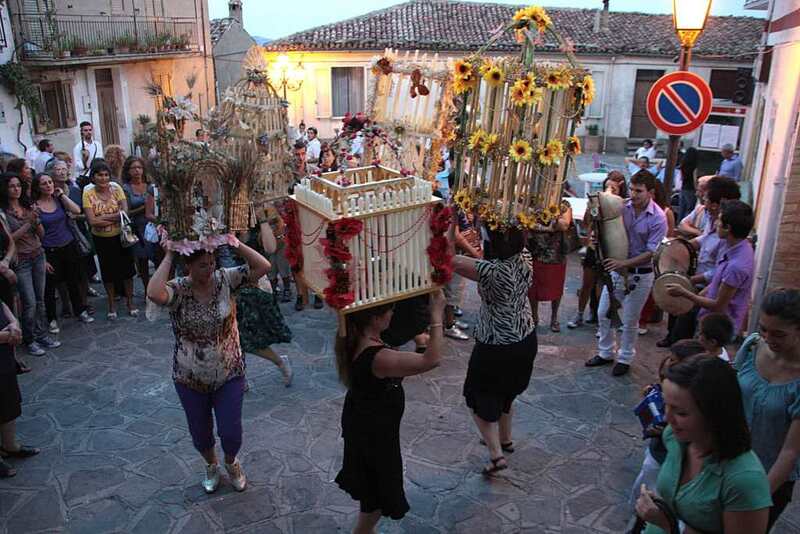 The village is celebrating, there's the band in front of the procession followed by the group of women dancing with crowns, the group of players, the women carring the Virgin Mary and the whole village behind. In six hours they will be visiting every house in Alessandria. Someone offers refreshments to the tired women, others make generous offerings to the Virgin Mary and recite prayers, others follow the procession from the balcony of their house. The music alternates between a powerful whole band and a miserable group of bagpipe and tambourine players. Unfortunately a few days ago in Alessandria there was a mourning, and so now the players prefer not to play. In this trip I have lost a lot of opportunities due to the mournings, I cannot bear them anylonger. The choral performance of the crowns is beautiful, women compete to wear one crown so the "owners" can rest and dance the tarantella more relaxed. This year also Isabella tries. At first she hesitated, perhaps she was afraid to fall and break the crown, or perhaps she was not sure to be ready ... to parade with the crown for the Virgin Mary is an important opportunity full of deep meanings. I watch her when she takes Margherita’s crown, I turn off the camera and I enjoy this scene without filters. Isabella hesitating calibrates the weight in the head and starts, she made it, she is ready and triumphant. This year there is also a man with the crown on his head; this is an extraordinary fact, the Madonna of Carmine is a purely feminine festival, but that crown is an historical one and belongs to a woman who has always participated in the procession, this year she can not do it because she is ill, he is his nephew. The procession continues, the women seem to be full of energy instead of beeing tired and continue to dance nonstop. It is evening, we reach the church, last spark of joy, then the Virgin Mary is undressed and the crowns put away until next year. Women are betting that there will be many more, and Alessandria goes back to its calm. Thanks to: the women of the crowns, Paolo Napoli, the City Council of Alessandria del Carretto, Mimma, Andrea the one of the accident and Giusi Duino. The staff of Radicazioni, Sandro Brunacci, Alessandro Adduci, the whole Alessandria. The sound impact that follows the song a 'Fronna' or more accurately 'fronn' and 'lemon' (lemon frond), together with the striking vision that was in front of my eyes, was devastating. 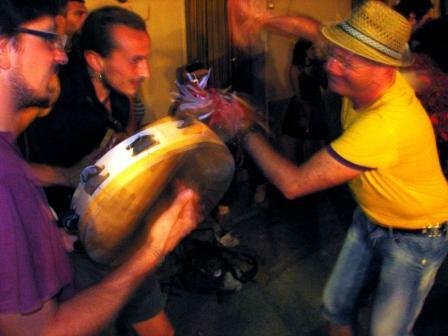 The reiterated vibration of the drum makes this form of accompanied singing both hypnotic and enthralling.You do not feel the need of other sounds, even if often organs, putipù, gypsies trumpet (marranzano) and tricchebballacche enrich the song, but the singing and the drum are the two reigning elements, independent from the rest and indissolubly dependent one to the other. Of course not everyone is capable of such wonders, although according to Raffaele and Catello recently there are tammorra players everywhere, and you could think it is easy beating on a drum while singing, however, some impacts can be reached only with many years of experience, especially of traditional knowledge through the observation of previous generations and sharing with them. Without these elements, you are not doing Tammurriata, but one thing from the scratch, with no precise meaning, without an identity and very bad for the true tradition. "This is a thousand years tradition but the origin is always very clear," Catello said "and when you hear an old man singing it is not just that he can sing but he sings with the experience of all those that came before him, and this can be recognized in the richness of the sound in the performance ... when you create something new without respecting the past, all this is lost. To live a tradition means to be able to interpret the sounds of the past and give them a consistent meaning in the present.This is why the middle class, who was born under different standards compared to the peasant society, can never play the tradition if they do not try to understand the codes that have created it. All this can be also applied to the tammurriate dance that today got forms and codes certainly different than the past when it was not socially accepted a "provocative" physical contact between the dancers. Today these tabu have obviously disapperead, the risk is once again to create a new form of dance, free from the "purity" of the past. Only with wisdom and respect you can adjust a movement mainly related to traditional rural codes to a modern social dimension that admits new behavior without popularizing the value. Raffaella Coppola and Maurizio Graziano Pollicino know it very well. They are the dancers I met in the past days in Campania (see photo and video below). Raffaella told me that during a party an old lady dancer of the village has proclaimed her the worthy successor. So if you will have the opportunity to spend some time in these areas and attend a country event where they dance and play until late at night, enjoy the feast and be carried from the energy of tammurriata and the hospitality of the players , dancers, singers, but try also to understand between them who is celebrating a tradition or just venting some personal repressions through the imitation of something that did not belong to him at all. 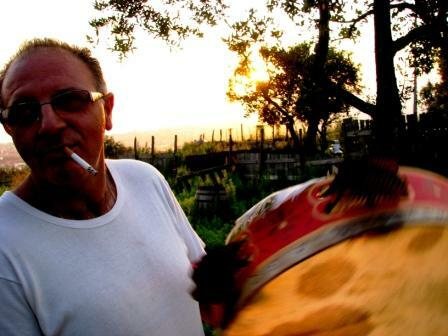 You don’t need to be ethnomusicology experts or Napolitain ... this feeling is clearly felt and comes straight to the heart, it is not explainable in words, it is simply in the vibration of the drum that is accorded to the voice and translated into movement. Thanks to: Raffaele Inserra, Catello Gargiulo, Raffaella Coppola, Maurizio Graziano Pollicino, Pietro Pisano, Marco Limato, Zi’ Giannino, Zi’ Rocco, Peppino di Febbraio, Raffaele’s wife, Iram, Fabrizio, Zeus, Dario Mogavero, Marilù Toledro, Alessandra Dell’aglio, Enzo, Domenico, Carmine Carbone and family, Giovanni Vacca.